The former Bell Labs Corporate Campus in Holmdel, NJ , completed in 1962, is recognized as an Architectural Landmark designed by world renowned architect Eero Saarinen. It was recently vacated by Alcatel –Lucent in 2007 and purchased by Somerset Development. The new master plan for the two million square foot facility was a re-zoning proposal to create a new mixed-use live/work environment. The approved plan allowed for perimeter land subdivisions for single family home developments with the redesign for the interior that allowed for a blocking and stacking strategy to accommodate multiple uses that include retail, hospitality, office, healthcare, residential and education use. 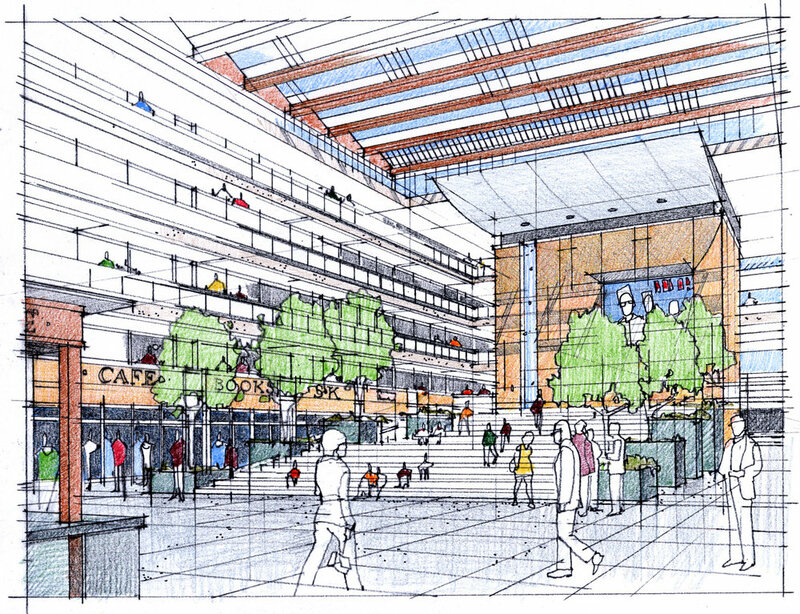 The 5 story atrium was envisioned as a new vertical urban center inside a New Jersey Suburb. On a parallel path of this re-zoning plan, a licensed medical surgery center was approved by NK’s effort that created a valuable asset for the Health Care Component of this project.